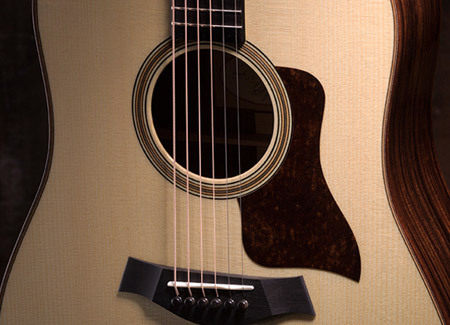 Indian rosewood’s rich musical properties have made it one of the most popular tonewoods in the acoustic guitar world. Among Taylor’s several classes of premium rosewood guitars, our 700 Series is the latest to reveal a tonal and aesthetic makeover. The result is a more powerful voice dressed in wood-centric appointment details that showcase an earthy, understated elegance. Our new 700 Series guitars are voiced to emphasize a fundamental, rootsy focus that gives back whatever the player puts into the guitar. A hybrid of Sitka and White spruce, Lutz produces a powerful tonal response similar to older Adirondack spruce, giving players a higher volume ceiling. 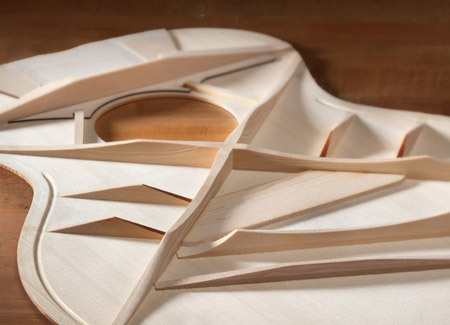 Our proprietary bracing scheme incorporates a two-piece bridge plate made of spruce and maple. Together with the Lutz spruce top and tone-optimizing protein glue for the bracing and bridge, these guitars are more dynamic and responsive. The aesthetic personality of the 700 Series projects a refined neo-vintage style. The refreshed appointment package incorporates warm, earthy hues and wood-rich details. Our new color blend features a smooth honey-brown gradient that artfully complements rosewood’s rich variegation and other aesthetic details. The three-ring design incorporates mirrored, bias-cut Douglas fir strips that reference a herringbone-style motif, accented with maple/black trim. The design features pale green abalone and draws from traditional shapes that were recomposed in a new way. Each element mirrors its opposing piece. Caramel-hued koa supports the organic visual aesthetic of the series. A matching back strip highlights the bookmatched symmetry of the back panels. Bias-cut, end-grain Douglas fir is arranged in a half-herringbone pattern and framed with maple/black accents. The treatment complements the rosette. The material features heat-treated and burnished fiber derived from wood. The mottled brown hues and matte finish resemble the look of seasoned leather.